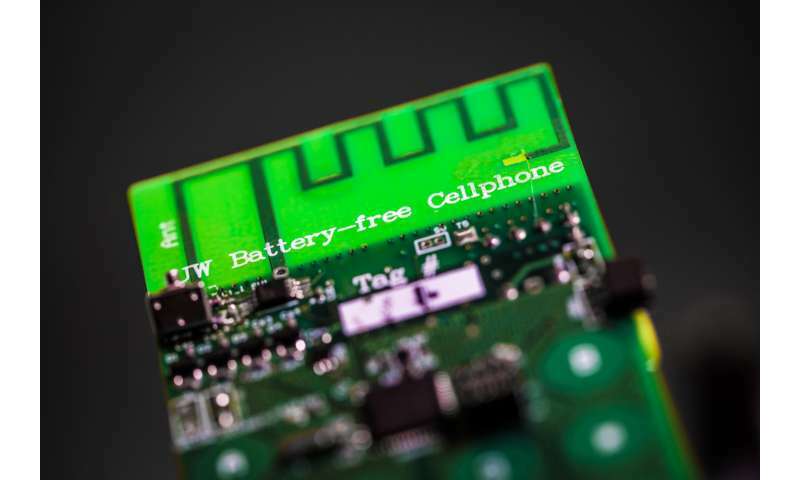 University of Washington researchers have invented a cellphone that requires no batteries—a major leap forward in moving beyond chargers, cords and dying phones. Instead, the phone harvests the few microwatts of power it requires from either ambient radio signals or light. "We've built what we believe is the first functioning cellphone that consumes almost zero power," said co-author Shyam Gollakota, an associate professor in the Paul G. Allen School of Computer Science & Engineering at the UW. "To achieve the really, really low power consumption that you need to run a phone by harvesting energy from the environment, we had to fundamentally rethink how these devices are designed." The team of UW computer scientists and electrical engineers eliminated a power-hungry step in most modern cellular transmissions—converting analog signals that convey sound into digital data that a phone can understand. This process consumes so much energy that it's been impossible to design a phone that can rely on ambient power sources. Instead, the battery-free cellphone takes advantage of tiny vibrations in a phone's microphone or speaker that occur when a person is talking into a phone or listening to a call. To transmit speech, the phone uses vibrations from the device's microphone to encode speech patterns in the reflected signals. To receive speech, it converts encoded radio signals into sound vibrations that that are picked up by the phone's speaker. In the prototype device, the user presses a button to switch between these two "transmitting" and "listening" modes. 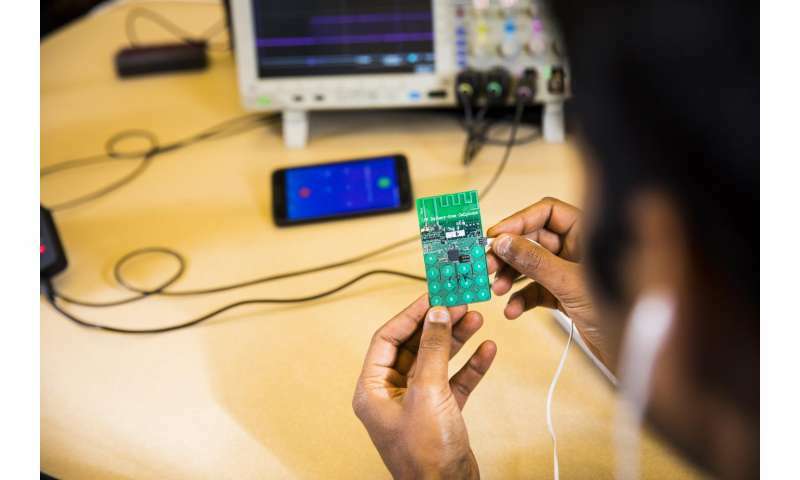 Using off-the-shelf components on a printed circuit board, the team demonstrated that the prototype can perform basic phone functions—transmitting speech and data and receiving user input via buttons. Using Skype, researchers were able to receive incoming calls, dial out and place callers on hold with the battery-free phone. "The cellphone is the device we depend on most today. 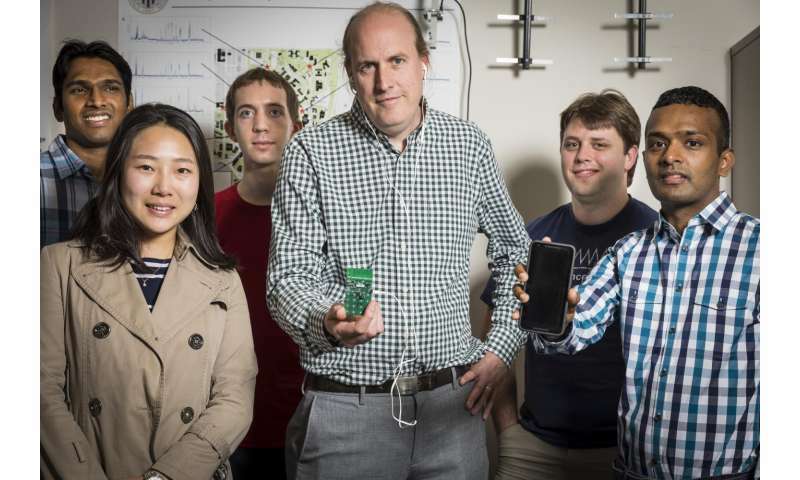 So if there were one device you'd want to be able to use without batteries, it is the cellphone," said faculty lead Joshua Smith, professor in both the Allen School and UW's Department of Electrical Engineering. "The proof of concept we've developed is exciting today, and we think it could impact everyday devices in the future." "You could imagine in the future that all cell towers or Wi-Fi routers could come with our base station technology embedded in it," said co-author Vamsi Talla, a former UW electrical engineering doctoral student and Allen School research associate. "And if every house has a Wi-Fi router in it, you could get battery-free cellphone coverage everywhere." Many other battery-free technologies that rely on ambient energy sources, such as temperature sensors or an accelerometer, conserve power with intermittent operations. They take a reading and then "sleep" for a minute or two while they harvest enough energy to perform the next task. By contrast, a phone call requires the device to operate continuously for as long as the conversation lasts. "You can't say hello and wait for a minute for the phone to go to sleep and harvest enough power to keep transmitting," said co-author Bryce Kellogg, a UW electrical engineering doctoral student. "That's been the biggest challenge—the amount of power you can actually gather from ambient radio or light is on the order of 1 or 10 microwatts. So real-time phone operations have been really hard to achieve without developing an entirely new approach to transmitting and receiving speech." Next, the research team plans to focus on improving the battery-free phone's operating range and encrypting conversations to make them secure. The team is also working to stream video over a battery-free cellphone and add a visual display feature to the phone using low-power E-ink screens. What a hot load of BS. Cell phones have to transmit using so much power because there is an unavoidable noise floor they have to exceed. This is fundamental physics stuff. I bet their "custom base station" probably only transmits a few meters at best. I too could build something like this with little effort - but why would I bother? Amusingly I recognize their antenna as one of the crappier versions commonly promulgated on the internet. They used the wrong one - they should have used one of the higher-efficiency inverted F antennas. I bet their "custom base station" probably only transmits a few meters at best. You can read that from the paper. They're using a wifi access point for the radio source. It's perfectly possible to reflect actual cellphone tower signals, but they're actually much weaker so there's not much to reflect. The system also does not operate like a standard cellphone, because the transmission is achieved by bringing an antenna in and out of resonance with the carrier signal, which changes the amount of reflection. The outgoing signal is not a standard cellular signal, but more like CB radio - it's analog AM transmission, which is why only one such phone can transmit on the frequency at one time - otherwise the signals drown in each other. In theory it should be possible to do CDMA which allows multiple access on the same channel, but that requires processing power from the transmitting device to de/encode and is no longer possible using just harvested energy. Very misleading title. This phone has to be within 30ft of a "custom base station". So it is basically a (battery-free) cordless phone for your home. But definitely not a cellphone you can walk around with outside. This reminds of NSA's retro reflector bugs that can transmit audio with barely any power.